I never realized how much I actually care for aliens. When aliens land on Earth, global business conglomerate Multi-National United forces them into rigid containment zones where they are compelled to labor, even as MNU commandeers their other worldly technology for profit. As tensions build between human and non-human races, a rogue agent leads a resistance movement against MNU’s ruthless consolidation of power. The first thing I noticed about this film is its style. It uses a lot of documentary-esque presentation, they use a lot of footage from interviews, the use of the shaky camera, and even some security camera footage. It’s that feeling of realism that sells the world and makes it feel like its a documentary and not another glitzy Hollywood production. The action is amazingly fast-paced, there’s humans shooting all over the place, and the way the special effects look. In many movies that use a lot of special effects they don’t really look real and your sort of just looking at the camera and saying, “oh this is a nice science fiction film”. However these aliens actually look like they could walk the Earth. They look all the very real, and add that in with a whole bunch of action you got a whole bunch of people sitting on the edge of your seat. The most powerful aspect of the film is witnessing all the horrible treatment of refugees. It’s interesting how the aliens are set up, because you have many conflicting feelings for them. On one hand your scared of them cause their just so darn ugly, but on the other hand you feel compassion for them because their treated like crap. This is a wonderful example of how special effects can work as the hand-maiden to story telling. The film has that documentary feel to it and it works well for awhile, but then by the third act it actually starts to abandon it and create a very standardized shoot-out scene. I feel like they could’ve done a better job with how the ending was handled, but it still did feel right by the end. Much of the dialogue is actually pretty cheesy and uses a lot of the same lines that I have heard over and over again. Sharlto Copley who plays the main character does a good job at playing the sort of anti-hero. He’s never acted before but he seems like he has acted all the time. At some points you love him and then at some points you really just want to kill him yourself. This film is very dark that and it brought up a huge social statement. It touches subject on immigration, the handling of refugees, and so many other subjects are brought up and what is done to these aliens you just feel so emotionally wrenched to. 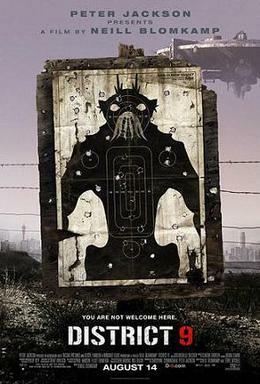 Consensus: District 9 has some very obvious plot holes, but is brings up many good points, and will leave you emotionally distraught with enough action to keep you on your seat amazed at how real it looks.